If the vehicle can no longer be centrally locked with the SmartKey, use the mechanical key. ► Close the front-passenger door, the rear doors and the tailgate. ► Press the locking button . ► Make sure that the locking knobs on the doors are still visible. Press down the locking knobs by hand, if necessary. ► Close the driver's door from the outside. ► Take the mechanical key out of the SmartKey . 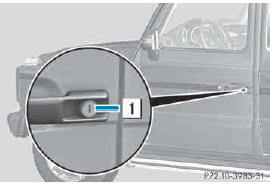 ► Insert the mechanical key into the lock of the driver's door as far as it will go. ► Turn the mechanical key clockwise as far as it will go to position 1. ► Turn the mechanical key back and remove it. ► Make sure that the doors and the tailgate are locked. ► Insert the mechanical key into the SmartKey. If you lock the vehicle as described above, the fuel filler flap is not locked. The antitheft alarm system is not armed.